The wisdom of crowds is comforting. 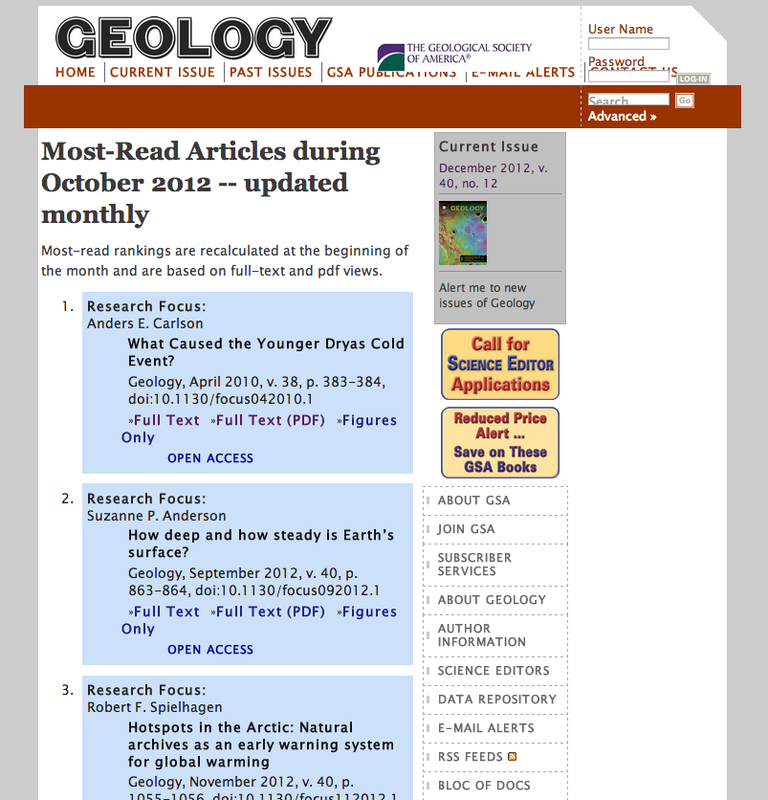 Despite the near total news blackout of the recent developments related to our subject, readers have shot Anders Carlson’s 2010 free paper, What Caused the Younger Dryas Cold Event?, to the top of the Most Read articles in the journal Geology. I am not surprised. This is an absolutely fascinating subject and normal people are roaming around reading all sorts of things without the filter of someone else at the keyboard. What makes Carlson’s broadly named journal article interesting is that it is clearly concerned with the Younger Dryas Boundary Hypothesis. He expresses a desire to test it more closely by appropriately examining existing ice records for chemical signals of the event, refering frequently to another objective overview from Melott which I am trying to post as well. Note Carlson’s paper was written after Surovell et al had supposedly dumped the last shovel of dirt on the body of the hypothesis. It is hard to keep a good theory down these days. Precipitation that fell on Greenland during the winter after Tunguska contains a strong, sharp spike in ammonium ions that can’t be explained by other sources such as wildfires sparked by the fiery explosion, says study coauthor Adrian Melott, a physicist of the University of Kansas in Lawrence. The presence of ammonium suggests that the Tunguska object was most likely a comet, rather than asteroids or meteoroids, Melott says. Any object slung into the Earth’s atmosphere from space typically moves fast enough to heat the surrounding air to about 100,000° Celsius, says Melott, so hot the nitrogen in the air splits and links up with oxygen to form nitrates. And indeed, nitrates are found in snow around the Tunguska blast. But ammonium, found along with the nitrates, contains hydrogen that most likely came from an incoming object rich in water — like an icy comet. More than a century after the impact, scientists are still debating what kind of object blew up over Tunguska in 1908. They also disagree about whether an impact or some other climate event caused the Younger Dryas at the end of the ice age. But the presence of ammonium in Greenland ice cores at both times is accepted. “There’s a remarkable peak of ammonium ions in ice cores from Greenland at the beginning of the Younger Dryas,” comments Paul Mayewski, a glaciologist at the University of Maine in Orono who was not involved in the new study. The new findings are “a compelling argument that a major extraterrestrial impact occurred then,” he notes. Whenever a comet strikes Earth’s atmosphere, it leaves behind a fingerprint of ammonium, the researchers propose. Immense heat and pressure in the shock wave spark the creation of ammonia, or NH3, from nitrogen in the air and hydrogen in the comet. Some of the ammonium, or NH4+, ions generated during subsequent reactions fall back to Earth in snow and are preserved in ice cores, where they linger as signs of the cataclysmic event. Although an impact big enough to trigger the Younger Dryas would have generated around a million times more atmospheric ammonia than the Tunguska blast did, the concentrations of ammonium ions in the Greenland ice of that age aren’t high enough. But the relative dearth of ammonium in the ice might simply be a result of how the ice cores were sampled, Melott and his colleagues contend. Samples taken from those ice cores are spaced, on average, about 3.5 years apart, and ammonia could have been cleansed from the atmosphere so quickly that most of the sharp spike might fall between samples. Revision received 28 October 2009.